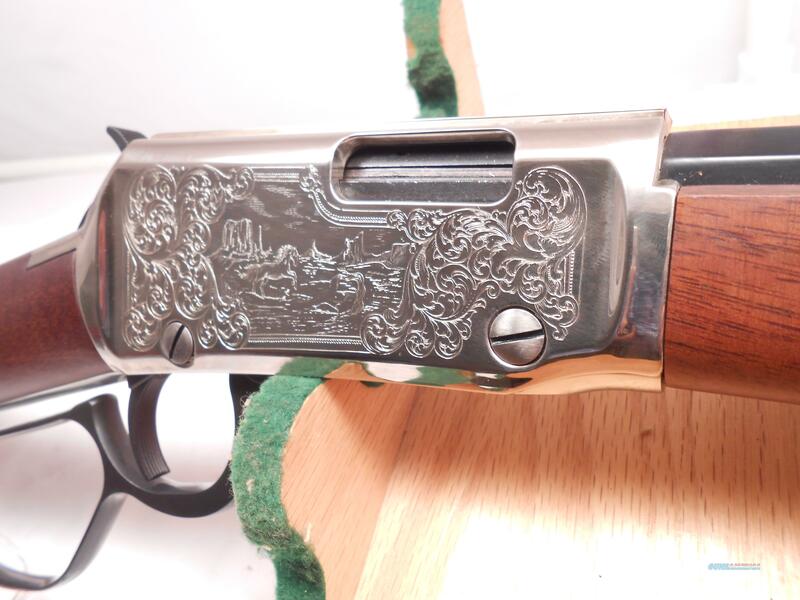 Beautifully Engraved Limited Edition Henry Rifle "Monument Valley Tribute"
Description: Manufacturer: Henry Repeating Arms== Model: H001TMV== Caliber: 22 S,L,LR== S/N: MV0275== Barrel: 20" Octagon== Description: This is a NIB limited edition tribute to Monument valley. On the Utah/ Arizona border in the Navajo Nation are some of the most picturesque scenery in our country. Director John Ford 7 movies starting in 1939 with "Stagecoach" which made John Wayne a star. You can own this beautiful intricately engraved one of 2015 limited edition. WE ARE A FULL LINE GUN SHOP IN MICHIGAN, AND WE DO OFFER A LAYAWAY PROGRAM. IT REQUIRES 25% DOWN WITH A 90 DAY PAY-PERIOD. YOU MAY RETURN A FIREARM IF WE REPRESENTED THE FIREARM WITH ANY WRONG INFORMATION ON AN AD OR IF THE FIREARM IS DEFECTIVE. THE BUYER HAS THREE DAYS TO INSPECT THE FIREARM AND CONTACT OUR STORE WITH ANY DISCREPANCIES. IT IS THE RESPONSIBILITY OF THE PURCHASER TO CHECK ALL STATE AND LOCAL LAWS CONCERNING THE ITEMS FOR SALE, NOT THE SELLER. THERE IS AN ADDITIONAL $10.00 FEE TO SHIP INTO CALIFORNIA. SHIPPING TO ALASKA IS DIFFERENT THAN LISTED SHIPPING PRICE, IT WILL BE CALCULATED AND PROVIDED AFTER FFL ADDRESS IS RECEIVED. ITEMS THAT ARE PAID FOR BY CHECK WILL NOT BE SHIPPED UNTIL THE CHECK CLEARS.